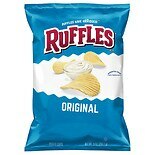 Shop Ruffles Potato Chips Original (9 oz. )9 oz. 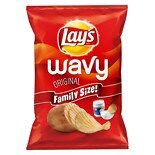 Shop Lay's Wavy Potato Chips Original (10.5 oz. )10.5 oz. 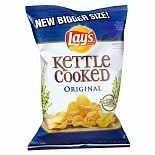 Shop Lay's Kettle Cooked Potato Chips Original (2.87 oz. )2.87 oz. 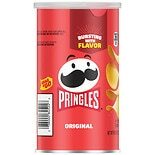 Shop Pringles Potato Crisps Original (5.68 oz. )5.68 oz. 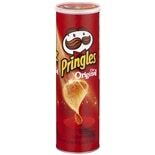 Shop Pringles Potato Crisps Original (2.36 oz. )2.36 oz. 2 for 2 dollars and 00 cents or 1 for 1 dollars and 29 cents 2/$2.00 or 1/$1.29$0.55 / oz. 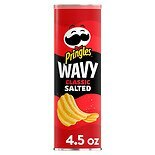 Shop Pringles Wavy Potato Crisps (4.6 oz. )4.6 oz. 3 for 5 dollars and 00 cents or 1 for 1 dollars and 99 cents $1.99 $0.44 / oz.